1916. 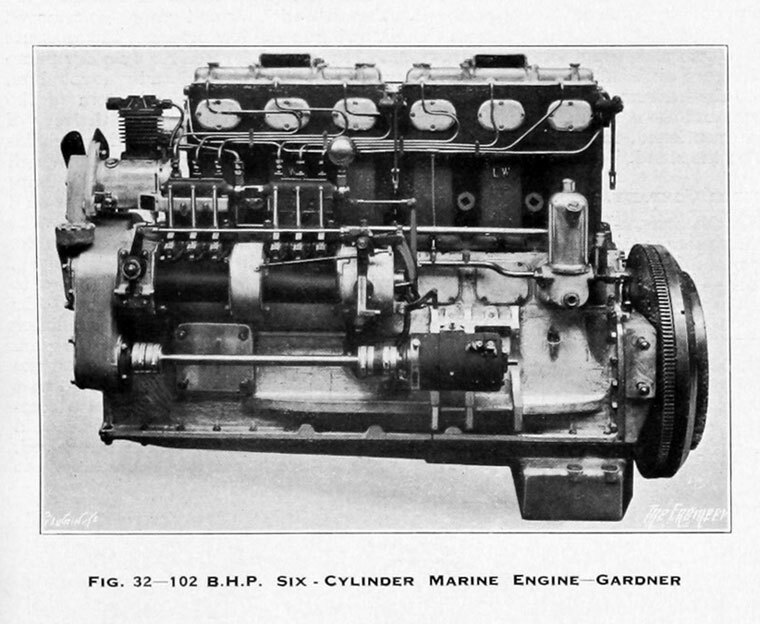 Gardner 1ACR Petrol engine. 4.5 hp. Exhibit at National Waterways Museum, Gloucester. Model 1L2. Exhibit at Internal Fire Museum of Power. 1929. 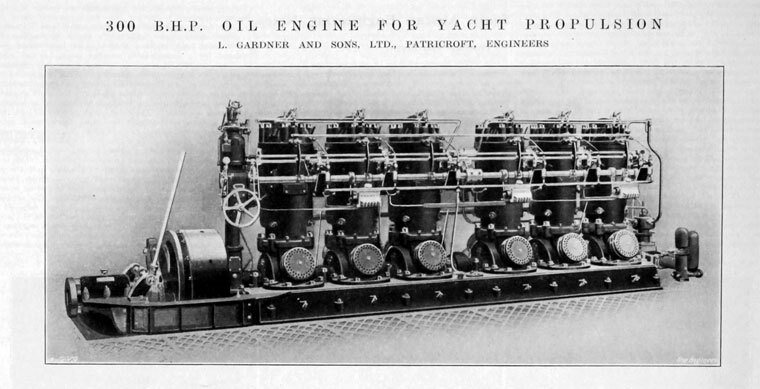 Four Cylinder Oil Engine. 1933. 102 B.H.P. 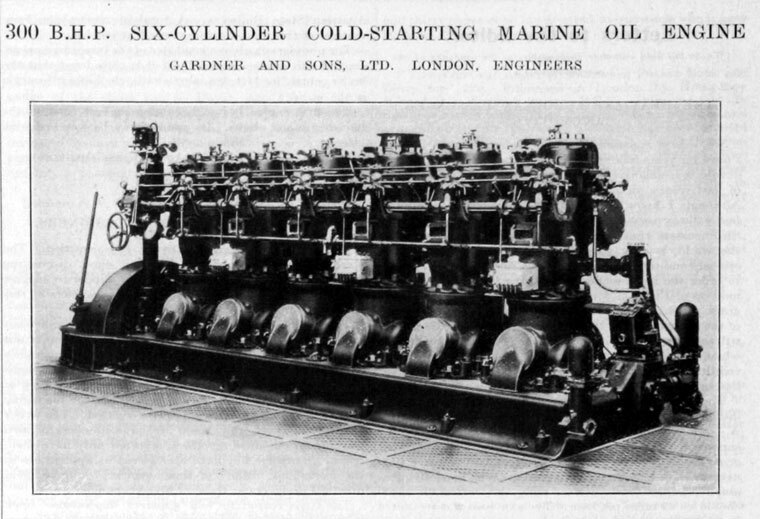 Six Cylinder Marine Engine. 1935. 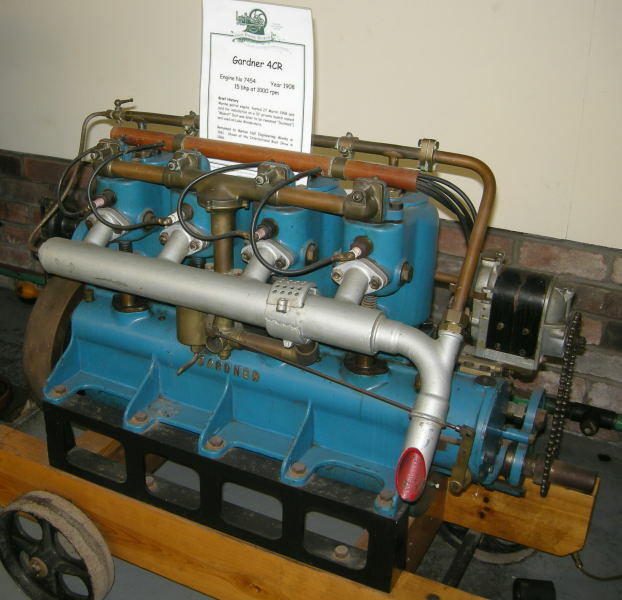 Model 3J5 Two-stroke Reversible Marine Engine from 'Cordelia II'. L. Gardner and Sons of Barton Works, Patricroft, Manchester were manufacturers of Diesel engines until the 1990s. 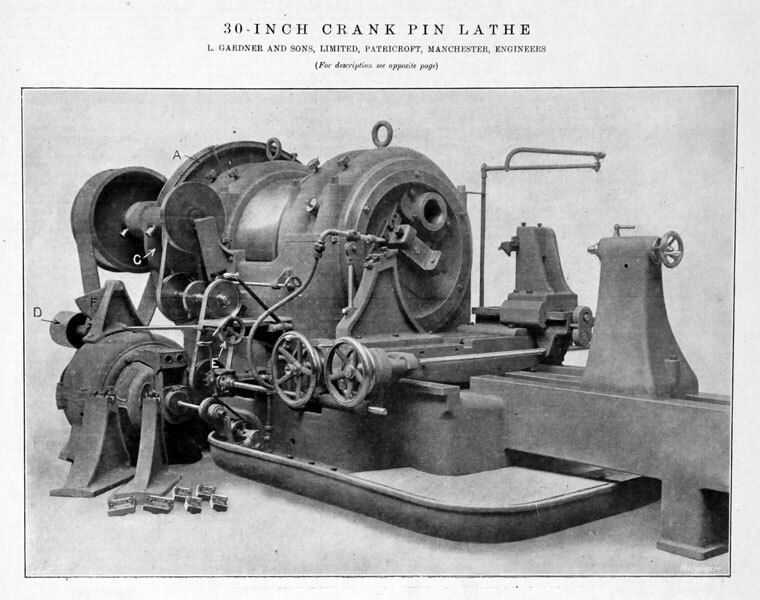 1868 Lawrence Gardner first went into business as a "machinist". 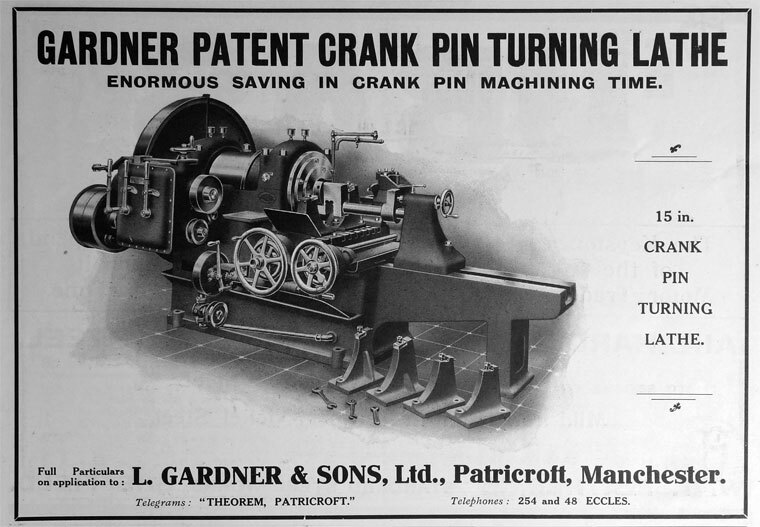 His brass plate proclaiming "L. Gardner Machinist" was screwed to the wall of one of four houses in Upper Duke Street, Manchester that he rented. His workshop was in the common cellar of the four properties. Lawrence and his wife lived in one of the four cottages, the other three being let to tenants. By putting up this plate, Gardner was doing no more than describing the principal service he offered. There was none of the self-conscious modesty that led Sir Henry Royce, after his partnership with Hon. C. S. Rolls had prospered, to describe himself as "Henry Royce, Mechanic". Yet the two businesses had more in common than brevity of style of their founders (both of whom were the sons of millers, the mechanics of agrarian England). 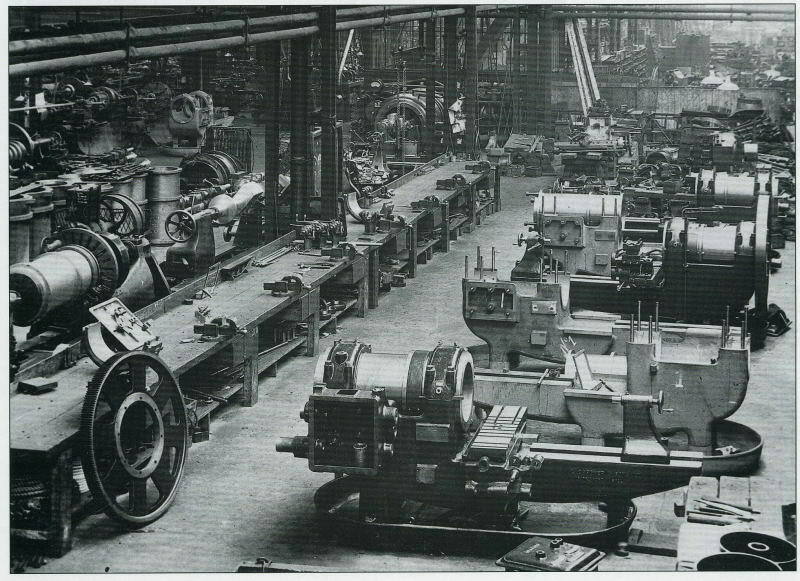 Both concerns were started in premises off Manchester's Stretford Road, and both turned from the manufacture of electrical dynamos (due to cheap imports of such machines from America) towards the products for which they became famous. Both were to dominate the quality end of their markets. But Lawrence Gardner was much the earlier; Henry Royce's business did not become established in Cooke Street until 1884. The Duke Street premises were not ideal - as the workshop was in the common cellar of the properties, equipping it meant lowering a 10 1/2 inch lathe, and an 8 foot boiler, through a trapdoor in the pavement, with pulley blocks on planks pushed out of a bedroom window to carry the load. Paving stones suffered as a consequence. 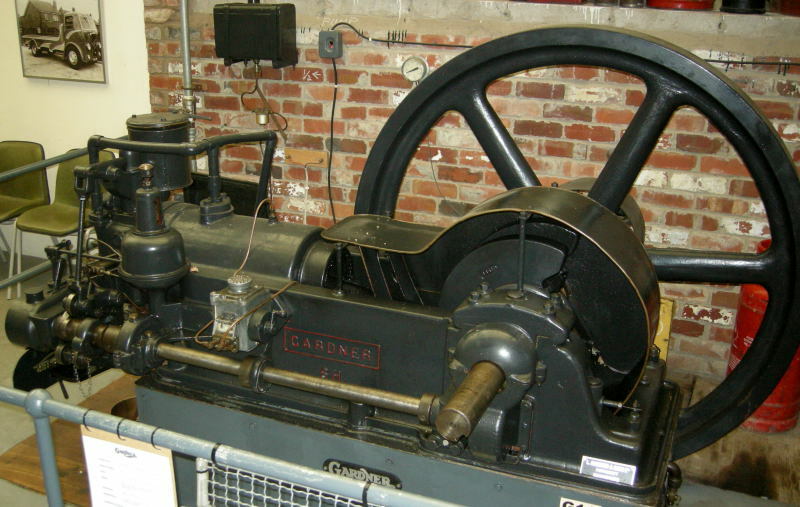 When two of his tenants defaulted on the rent, the landlord threatened to foreclose on Gardner's machines, for they were all that was of value in the houses. With a building society loan, at a weekly repayment of 31 shillings and 6 pence, Gardner was able to buy the property, thereby securing his base. But collecting the weekly rent in sums between 3s 6d and 6s 3d remained an embarrassment until his loan was repaid. Gardner's business quickly developed into more than the repetitive work on other peoples castings that the "machinist" label suggests. Machine parts, machines and machine tools were made: parts for sewing machines, a machine to score cardboard, another to cut dovetails in it and a small steam hammer to hammer them into place; milling and cutting machines; another for cutting out cloth. The business was that of a general engineer with no particular speciality. The first move for the expanding business was not far, to a new works built on the other side of the Stretford Road, in Cornbrook Park Road. In contrast to the Duke Street basement it was of two stories, providing 1,300 sq. ft on each floor. Apart from the family, who were growing up and learning their trade as engineers, there were twelve employees. The engineering became more general than ever: a coffee roaster was added to the list of products. 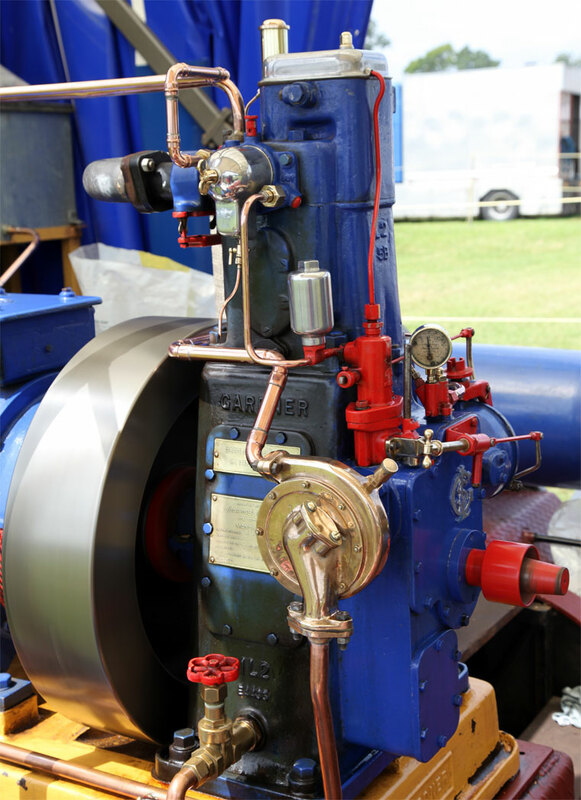 It comprised four horizontal drums rotating above a gas flame, geared together and belt-driven from a hot air engine. This, like every job, demanded invention and skill; there was no buying in of part-finished components. Gears had to be cut out of brass and filed by hand sufficiently accurately that they could serve as a pattern for castings. 1890, at the age of fifty, Lawrence Gardner died, leaving the business to his widow. His son, Thomas Harry, was then almost thirty. The two had not always agreed. Thomas's drive, coupled with the lack of education of his father, had widened the rift between the generations. In the 1880s, Thomas worked away from home for a while. But when the need to accept responsibility arrived, he was ready. The respect which Thomas, Edward and the three younger brothers, Lawrence, Ernest and Joseph had for their father was to be shown ten years later when a much altered business came to be incorporated as a limited liability company. They chose to keep the style L. Gardner and Sons rather than change the title to "Gardner Bros". a range of dynamos, the heaviest weighing three tons and driven from a mill engine via a 12 inch belt and a 14 inch pulley. The Dental Manufacturing Co became an important customer. Dentists' chairs, some raised hydraulically, and some by rack and pinion, were developed and 106 were made in the first three years at Lund Street. 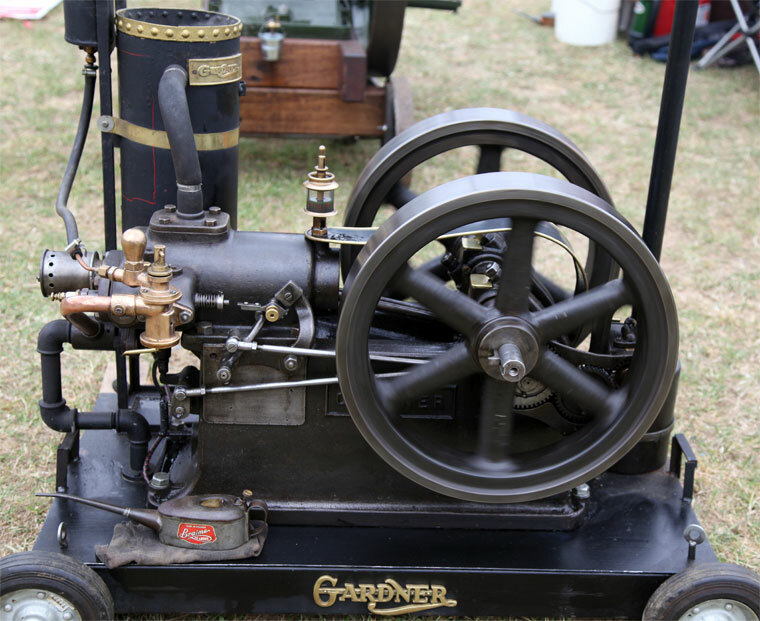 Two were known to be still in use locally in recent times, an early example of longevity in a Gardner product. A machine for cutting rivets out of platinum wire for use in making false teeth was followed by moulds for the dentures themselves, and vulcanizing boilers. 1891, On 21 November, the Illustrated Magazine of Practice and Theory described a patent hot air engine designed by A. E. and H. Robinson as a "useful and thoroughly good motor for driving small machinery". Gardners arranged to manufacture this. It was their first "combustion" engine. 1893 Example of Hot-air engine to Robinson's Patent. Exhibit at Manchester's Museum of Science and Industry. 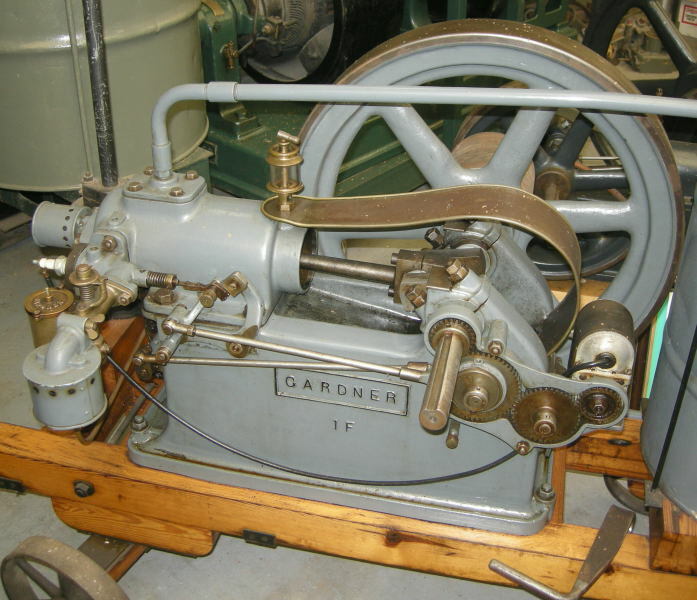 1894 Gardners produced their first Robinson hot air engine under licence. 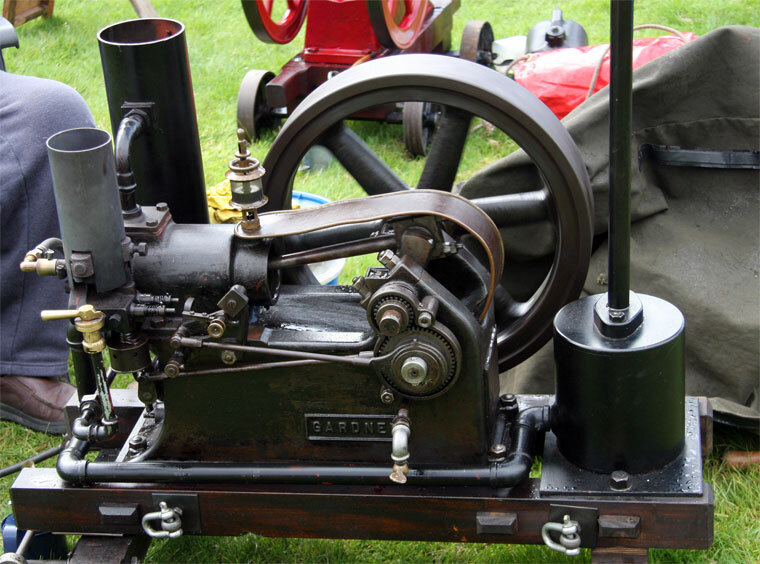 The Robinson hot air engine had a bore and stroke both of 10 inches and developed 5/8 hp when running at 170rpm. Heat was generated by burning coke in a fire box at the rate of 7 1/2 lb/hr which meant a thermal efficiency of between seven and ten percent. (Modern Gardner compression ignition engines achieve forty percent). It weighed 12 cwt. A pre-1900 example, recovered from a farm in Horsham, Sussex, had pumped water until damaged by frost in the severe winter of 1958 . Although it was to sell well for many years, the Robinson engine offered little or no opportunity for development. 1906 A 65 horse-power Gardner paraffin engine was one of the exhibits in the Marine section of the 1906 Motor Show at Crystal Palace, shown by Messrs. Norris and Henty, 87 Queen Victoria-street, London . 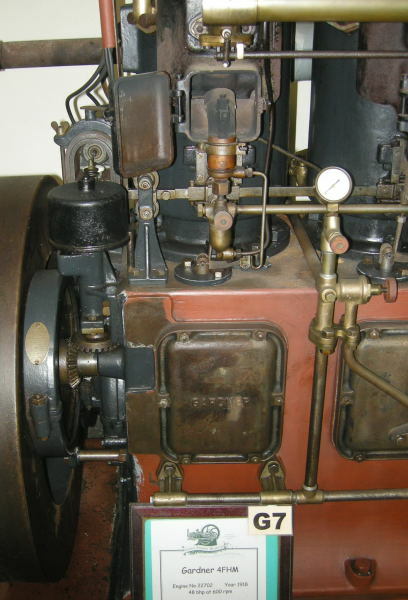 The engine had four vertical cylinders and an atmospheric burner for vaporising the oil with a Simms-Bosch magneto. 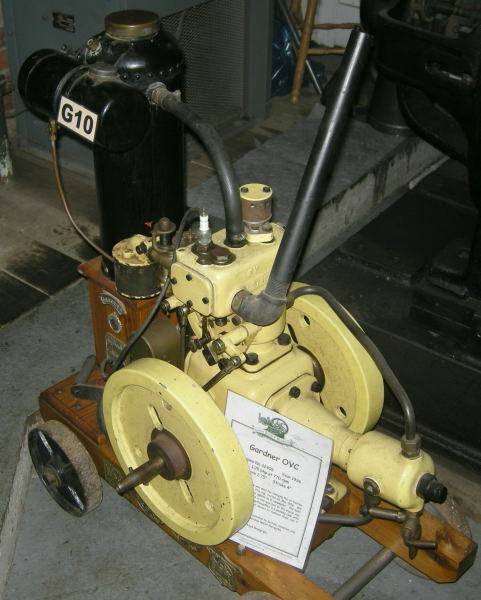 The governor was of the centrifugal type, operated by gearing direct from the lay shaft, and acting on the inlet valves, and sparking apparatus on the "hit-and-miss" principle. By means of a hand lever and sector the governor and timing gear could be adjusted so as to reduce the speed. A small supply of water was introduced into the cylinders when working on heavy loads. 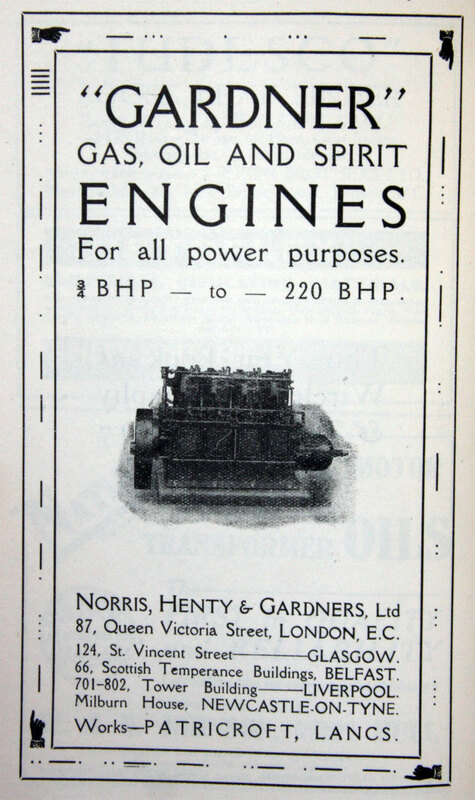 1912 Sales arrangement for Gardners diesels reformed as Norris, Henty and Gardners. 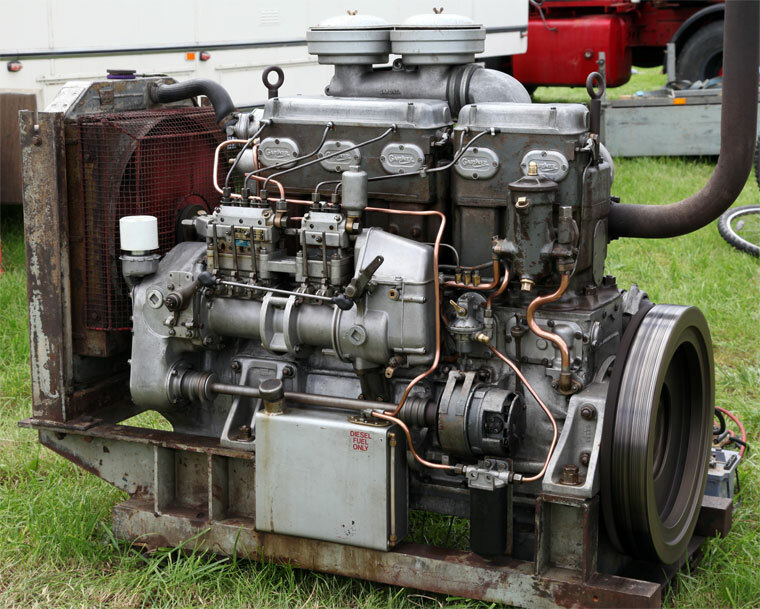 1931 The LW engine was introduced, designed for road transport applications. 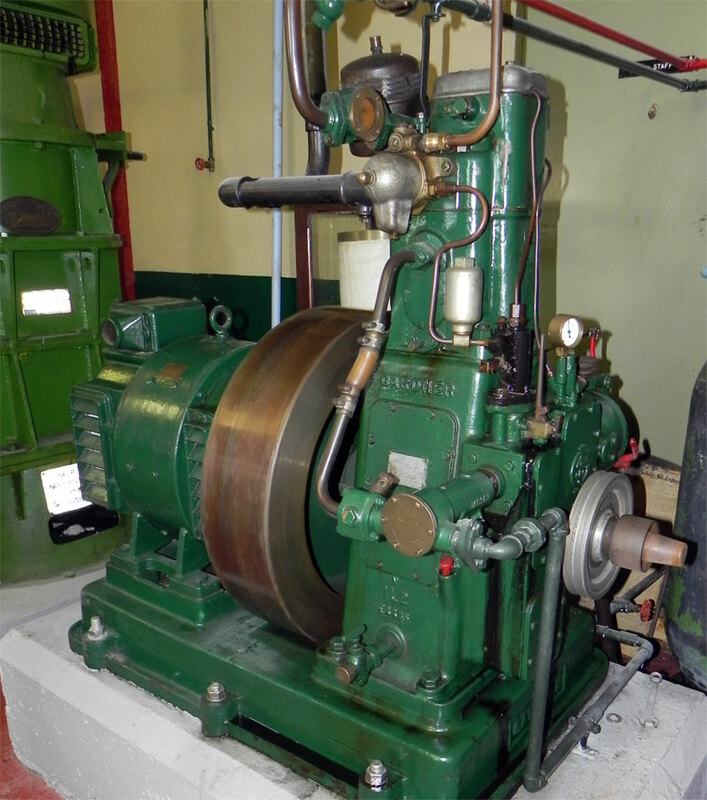 1932 The L2 engine was introduced, designed for stationary and marine use as it is a heavy engine. 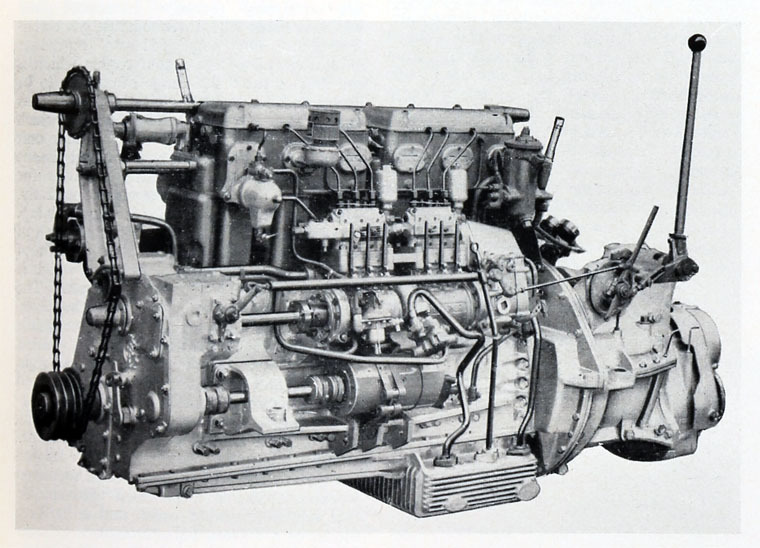 1935 The 4LK engine was introduced with block and head in alloy to reduce the weight. 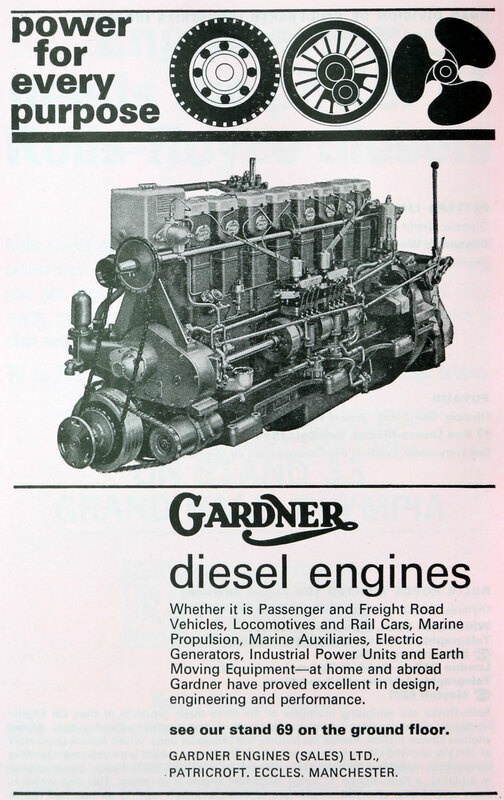 1944 Gardners were producing three types of diesel engines - LW, L2 and 4LK. 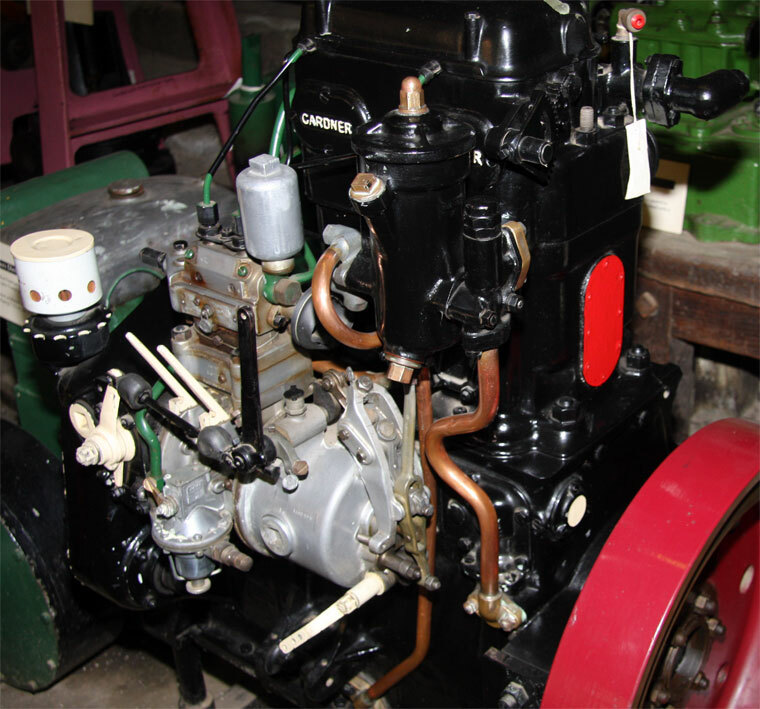 The L2 was available in 2, 3, 4, 5 & 6 cylinder blocks. 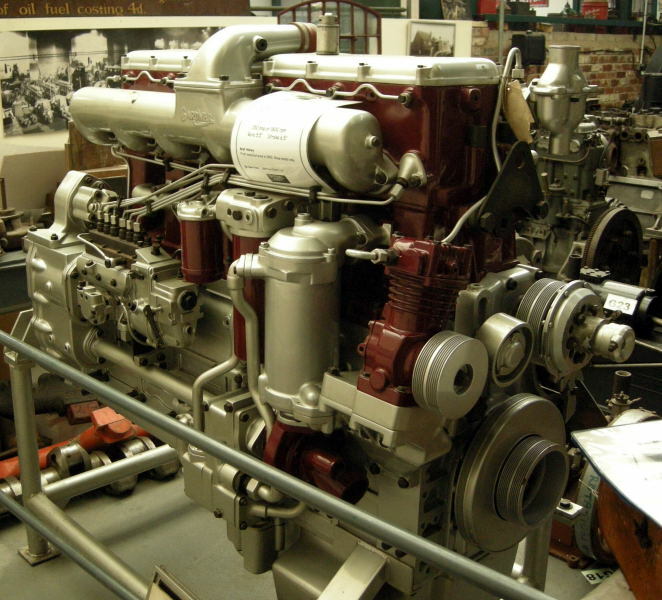 1944 The 4L3 engine was produced for marine use. 1950 Ordinary shares listed on Manchester Stock Exchange. 1955 Joseph Gardner, chairman and managing director, died. 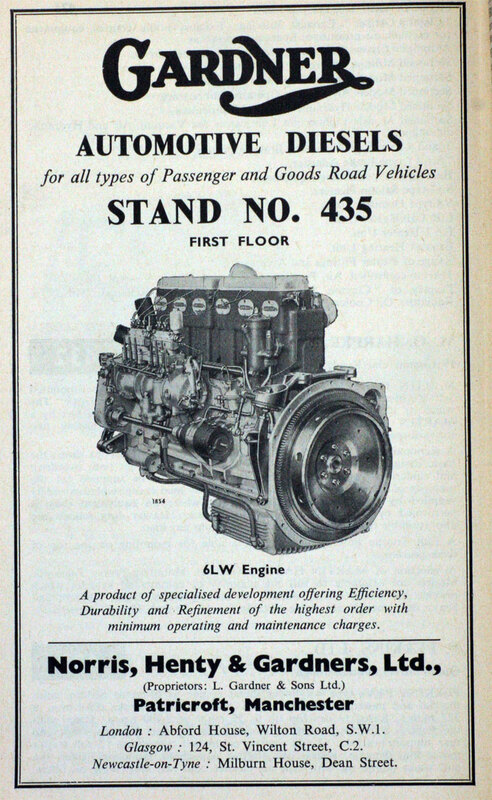 1961 Manufacturers of internal combustion engines for marine, transport and industrial purposes. 2,500 employees. 1968 In recognition of the centenary of the company, the dividend was raised. 1977 In April, L. Gardner and Sons purchased 8.5% of ERF . 1977 Hawker Siddeley announced a bid . 1977 In August, L. Gardner and Sons was acquired by Hawker Siddeley as the result of a cash offer for the company's shares. 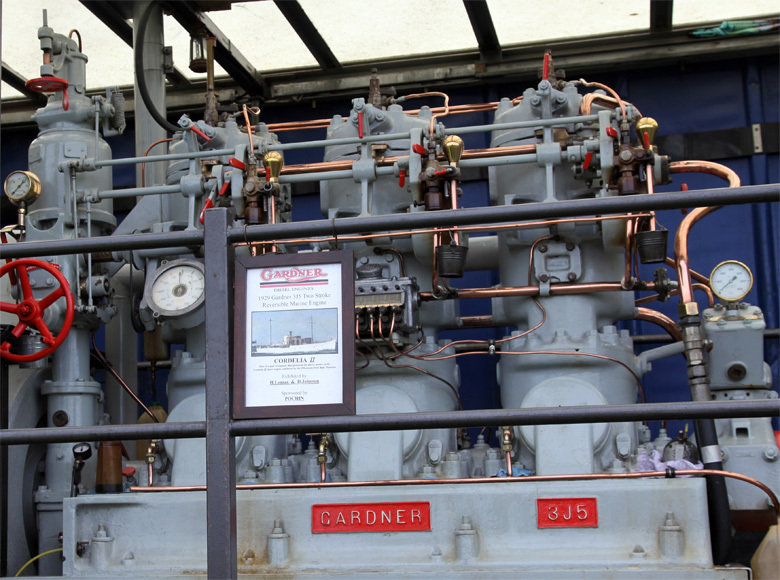 The Gardner name continues to be used by a number of companies - Gardner Marine Diesels overhauls, re-manufactures and installs a wide range of marine-specification Gardner engines; Gardner Parts Ltd supplies parts for Gardner engines of all types. 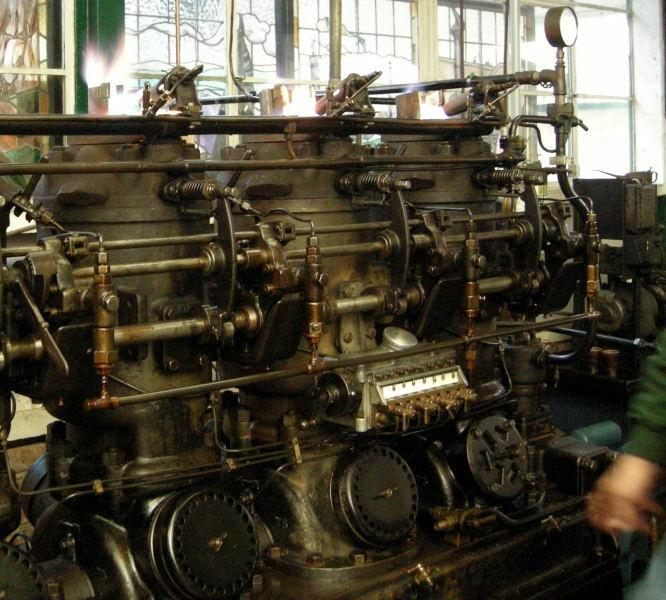 Another firm, Gardner Enthusiast Ltd, manufactures piston rings, engine valves and major castings for Gardner engines. 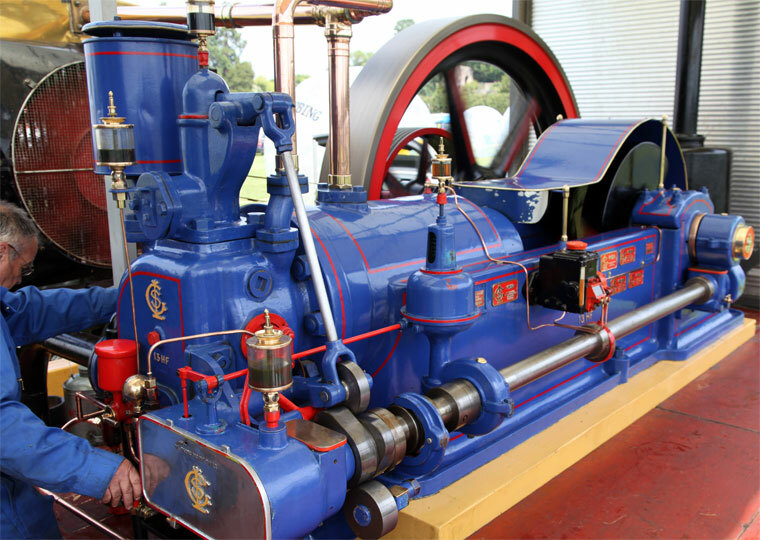 Others offer services for surveying and overhauling these long-lasting engines. 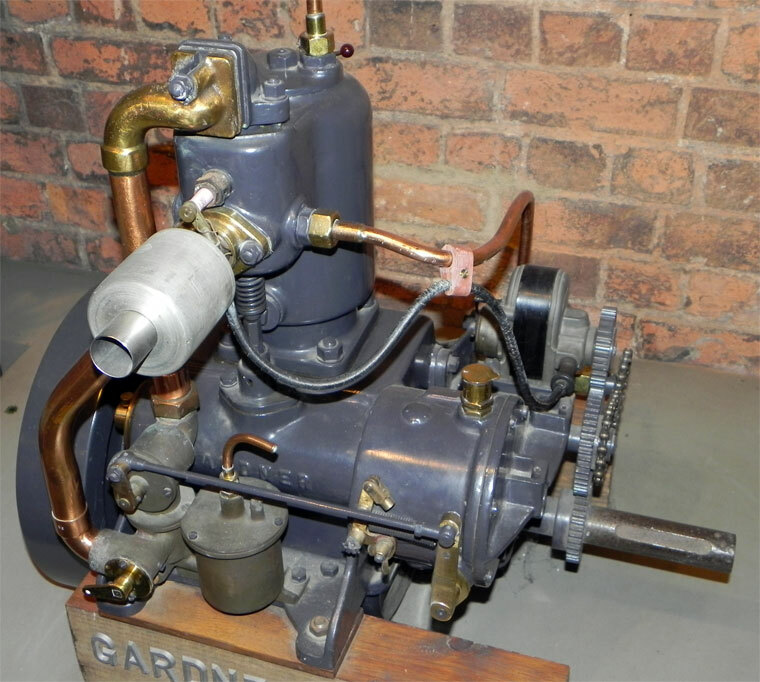 There are numerous examples of Gardner engines on display at the Anson Engine Museum. Exhibits include types O, 1B, X, 2V, 4CR, 4FHM, 4T5 1L2 6LW and others. Around twenty engines on show. F type. Horizontal engine. First produced in 1910. H type. Horizontal engine. First produced in 1910. VT range. Introduced in 1913. 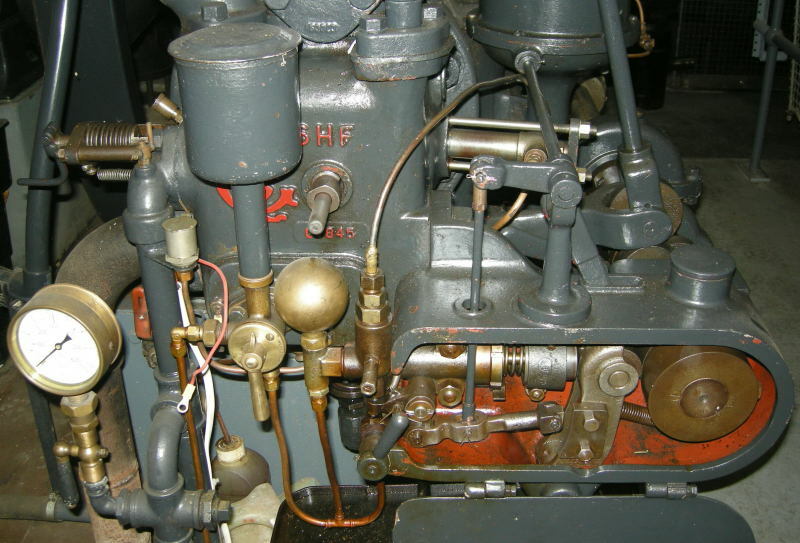 Hot-bulb semi-diesel engine. T range. Introduced in 1920. L2 range. Introduced in 1929. 1L2 single cylinder engine develops 11 bhp at 1100 rpm. 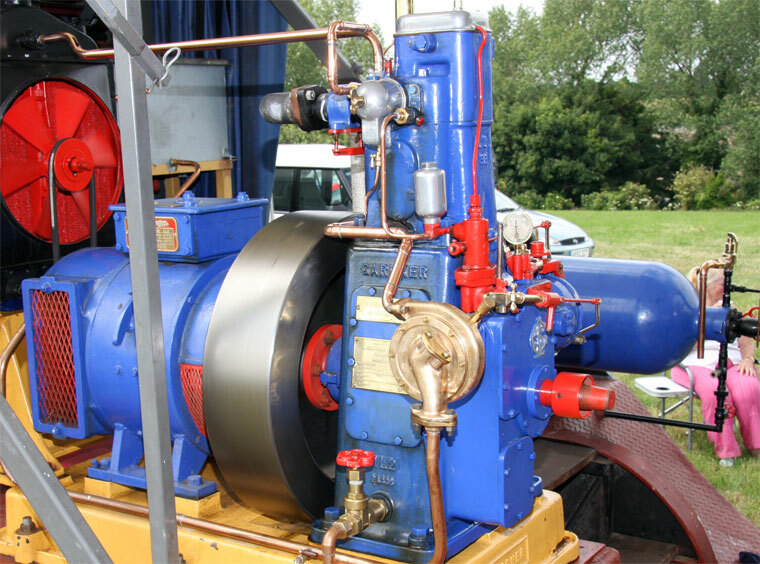 4L2 (50 bhp at 1,300 rpm) and first order from Barton Transport for buses. Range eventually covered from one to six cylinders. L3 range replacing the M and Cr types. Marine use. Three to eight cylinders. LW range. Introduced in 1931. 2LW (twin) develops 31 bhp at 1500 rpm and has a swept volume of 170 cu ins (2.8 litres). 3LW develops 47 bhp at 1500 rpm and has a swept volume of 255 cu ins (4.2 litres). 4LW develops 62 bhp at 1500 rpm and has a swept volume of 340 cu ins (5.6 litres). 5LW 7-litre five-cylinder. The 5LW develops 78 bhp at 1500 rpm and has a swept volume of 426 cu ins (7.0 litres). 6LW develops 94 bhp at 1500 rpm and has a swept volume of 511 cu ins (8.4 litres). The 8LXB has a swept volume of 851 cu ins (13.93 litres). At 1500 rpm the engine develops 170 bhp. 8L3B develops 230 bhp (171.51kW) at 1150 rpm and has a swept volume of 1,473 cu ins (24.138 litres). 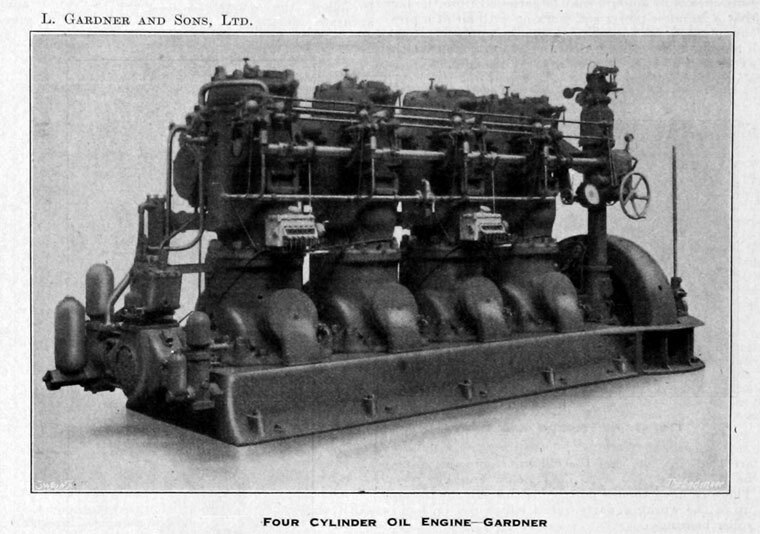 4LK four cylinder engine. At 1800 rpm the 4LK develops 51 bhp. The 6L3B develops 172 bhp at 1150 rpm and has a swept volume of 1,105 cu ins (18.103 litres). 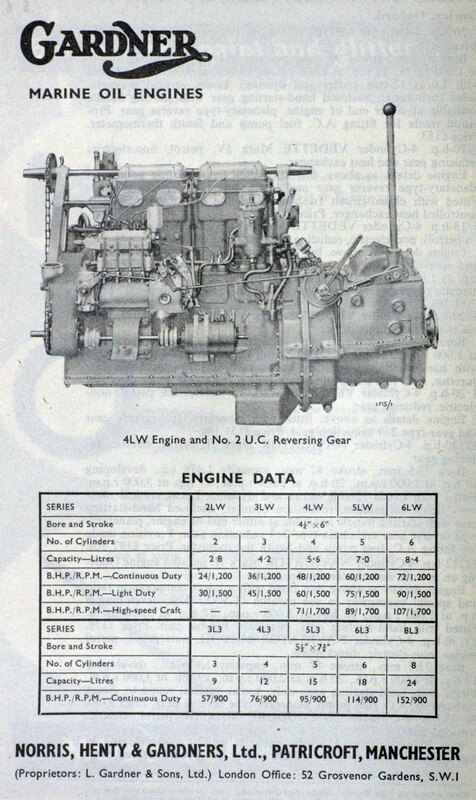 The 6LXB has a swept volume of 638 cu ins (10.45 litres). At 1500 rpm the engine develops 127 bhp. 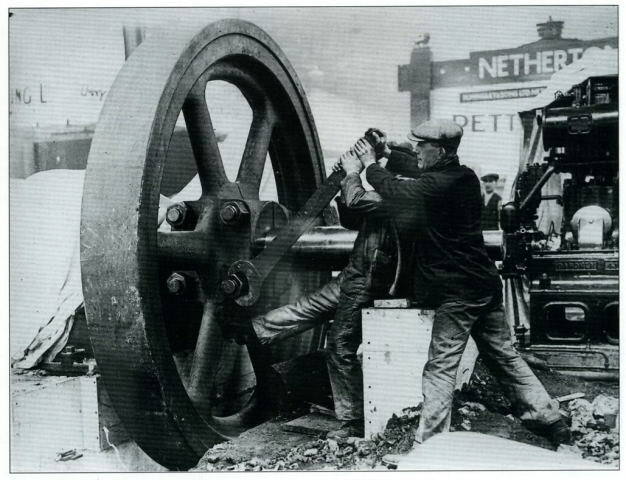 Thanks to David Whitehead for information gleaned from his book 'Gardner's of Patricroft 1868-1968'. 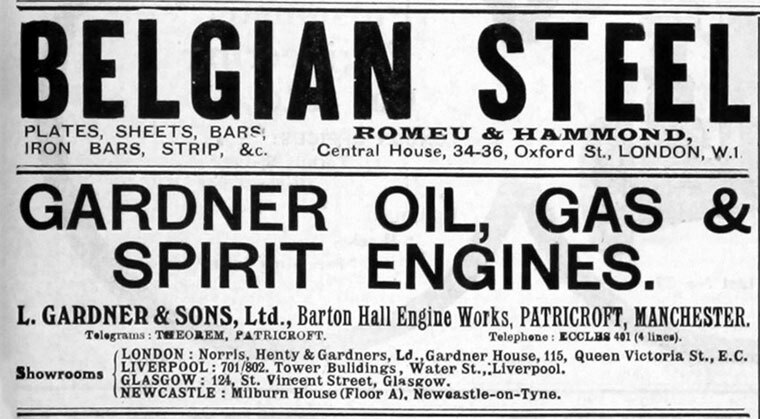 Published for L. Gardner and Sons Ltd. By Newman Neame Ltd. A member of the Pergamon Group. The text on this page is a precis form of the content of the book copyrighted to L. Gardner and Sons Ltd. 1968. 'L. Gardner & Sons Limited - Legendary Engineering Excellence, by Graham Edge', Gingerfold Productions (reprinted 2006), Transport Archive Series, provides a superbly-produced account of the history of the company and its products. It contains numerous high quality illustrations, two of which have been reproduced here, with the kind permission of the author. This page was last edited on 11 March 2019, at 13:08.